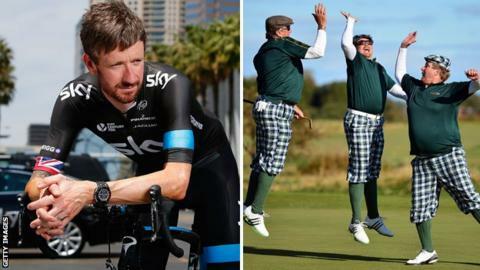 Is the newly 'cool' sport of cycling really the new golf? That cycling is the new golf has become an anecdotal truism. As golf participation has fallen dramatically in Britain in recent years, cycling has boomed, fuelling the perception that where there were once sets of clubs gathering dust in millions of garages, there are now spanking sets of wheels. The figures suggest more of you will be receiving cycling-related kit this Christmas than golf-related caboodle. Sport England reckons there were more than two million adults cycling at least once a week between April 2013 and April 2014, compared to 710,400 taking to the fairways. Now there is evidence, albeit tentative, to suggest the truism might actually be true and that golfers are indeed morphing into cyclists. A 2013 study by Sports Marketing Surveys, which has been examining golfers' habits for 17 years, showed that 20% of golfers who packed up the game in the past six to 24 months - whose reason was to take up a new activity or sport - did so to take up cycling. More studies need to be done but the anecdotal evidence was already persuasive. Golf and cycling overlap in terms of their socio-economic profiles. Both sports can be reasonably cheap, but they can also be eye-wateringly expensive. Golf has always had players with 'all the gear and no idea', but cycling also has its own somewhat pejoratively named demographic: 'Mamils', or 'middle-aged men in Lycra'. Last month, Sir Bradley Wiggins expressed his amazement that cycling had gone from being a slightly eccentric pastime to "cool" in such a short space of time. As somebody who shares office space with hundreds of Mamils (the BBC is crawling with them, not to mention Mawils), I heartily disagree. But if not cool as such, cycling has certainly become mainstream and aspirational. So what is cycling doing right that golf is not doing? After all, while it is true that Wiggins has been an integral part of British cycling's remarkable rise over the past decade, courtesy of his Tour de France victory in 2012 and four Olympic gold medals, the UK's elite golfers haven't been doing too bad either, serving up four different major winners in the last five years. World number one Rory McIlroy won two of them in 2014. But when the best golfer in the world is telling us his sport needs to get its house in order - as McIlroy did at this year's Masters and again after finishing runner-up at Sports Personality of the Year - you know the sport is not as cool as it should be. And not as cool as cycling apparently is, despite being responsible for acres and acres of unsightly Lycra, stuck fast to wobbling limbs like so much cling film. "Golf costs too much, it takes too long and it's difficult," says Peter McEvoy, amateur legend, course designer, administrator and co-inventor of PowerPlay Golf, which it was hoped would be the game's answer to Twenty20 cricket. "The manufacturing industry continues to address the difficulty issue, by making the game easier to play and therefore more palatable. But with PowerPlay we tried to address the main issue, which is that golf takes too long." "Everything's so instant now and everyone doesn't have as much time as they used to. So you maybe try some way of speeding the game up." PowerPlay, which was played over nine holes and featured two flags per green and bonus points, was well backed by the game's stakeholders. The staunchly traditional Royal and Ancient, which deigned to admit women members only a couple of months ago, helped write the rules and the European Tour allowed events to take place in conjunction with its own tournaments. However, when PowerPlay's main sponsor went bust in 2011, the format was mothballed. But golf administrators remain acutely aware that societal changes, whereby would-be golfers are spending their spare time on less time-consuming activities, mean alternatives to the traditional 18-hole format must be made available. The problem is not necessarily, as McIlroy seems to believe, that golf is not played fast enough. It is that the whole concept of 18-hole golf does not fit in with many modern lives. "When I stopped playing cricket, I toyed with the idea of getting really into golf," says Sean Balmford, a 50-year-old derivatives broker from Essex. "But golf takes too long. It's a five or six-hour thing and I've got three kids, so it's not fair to be disappearing for that amount of time on a weekend. "What appeals to me about cycling is that you can go out for as little or as long as you like. You can go out for a 40-minute hard ride on your own or, on a nice, sunny day, you can go out with a couple of mates for a couple of hours." England Golf chief executive David Joy concedes golf has to become more flexible. But you might be surprised to learn that he sees increased golf club membership as key in arresting the slide in participation. Surprised, because golf clubs have long been perceived - rightly or wrongly - as exclusive, stuffy and unwelcoming. "We need to address the time issue," says Joy. "That means offering six- and nine-hole options, so that you can leave the house, play and be home again in a few hours. If we do that, more people will be choosing golf over cycling. "The 25% of golf clubs that are enjoying membership growth [overall golf club membership fell 20% in England between 2004 and 2013, and 14% in Scotland] have realised the needs of potential members have changed. They offer flexible memberships - Sunday memberships, twilight memberships, 10-15-rounds-a-year memberships. "Golf clubs also need to be modern places, friendly places, places with relaxed dress codes where you can use the internet and families are welcome. "Our research shows that club members play more often - 65% of members play every week - so our strategy is to get more golfers into clubs. But a recent survey showed the average number of members recruited by clubs in the last two years was 77, but the average number leaving was 84. So quite clearly the product that's being offered in too many clubs isn't right at the moment." Cycling might not seem like a social sport - try chatting about the scandal of Jimmy Bullard's early eviction from the Celebrity Jungle while you're battling a hill in Cumbria. But the fact that cycling is a bespoke pastime appeals to a British society that is less rigid than it once was. Balmford and his mates - 'The Shenfield Shifters' - have a clubhouse, but it's actually a pub. "There'll be between six and 10 of us," he says. "We'll ride for a couple of hours and then head straight to the bar. We catch up, have a beer, but we're also keeping fit. It's the perfect social pursuit." Adrian Markham, a 39-year-old project manager from Lincolnshire, has thrown himself into sportives, mass-participation cycling events. Crucially, cycling makes Markham happier than golf ever did. "I got disillusioned with golf," he says. "I was putting in lots of time at the driving range, playing competitions, reading psychology books and getting so little reward. Because it became all about the score, I wasn't enjoying the game itself. Golf is so difficult, so it's difficult to enjoy it. "Cycling is more inclusive. I'm not beating myself up every time I get on a bike. I did a sportive last week - started in Clitheroe, went up through the Forest of Bowland. It was brutal at times but the sun was out. I took in the scenery. I wasn't trying to beat a time. I was just out to enjoy it. "Sportives are social events, occasions in stunning places that bring a good mix of people together. Cycling is a whole new life, it's been a bit of an eye-opener." Chris Nash, a 45-year-old from Salford who works in customer service, says one of the big appeals of cycling is that the whole family can get involved. This Christmas, Santa Claus will deliver both him and his daughter brand new bikes. "Since my daughter arrived I've had less free time and the golf clubs haven't left the shed," says Nash. "Modern men can't get away with disappearing for seven or eight hours on a Sunday like our dads might have done. My missus would be a lot less tolerant than my mum was. "And the golf clubs I used to play at weren't welcoming environments for children. Golf has always had that feel about it. But cycling feels inclusive. It's something we can do as a family, which never would have happened with golf. My wife never got golf, whereas now she's talking about maybe getting a bike as well." While Joy points out that 100,000 women are members of golf clubs in England, he also admits that the amount of girls is at an all-time low. He cites conservative dress codes and stubborn, old-fashioned notions of what golf clubs look and feel like as barriers to girls getting involved. In contrast, British Cycling reported that more than 100,000 women joined its programmes in 2013 and a 24% increase in the number of women racing in formal cycling events. This surely has something to do with the recent proliferation of female role models in British cycling, with Victoria Pendleton and Laura Trott to the fore. Golf administrators must hope English prodigy Charley Hull can do the same for their sport. Then there is the clamour for kit, as well as caboodle. While both golf and cycling are battling for people's time, they are also battling for people's money. And while bicycle sales increased by 14% in the UK between 2008 and 2013, the British Golf Industry Association recently revealed that members' sales had fallen for the past four years. "I'm constantly upgrading my bike here and there," says Balmford. "It might be a new set of wheels, a new chain, new cogs, the list goes on. With all the gear you can buy you can easily be spending a couple of grand a year." That's a lot of money that a decade or so ago might have been spent on adjustably weighted putters, laser-milled wedges and drivers that promise to elevate 'smash factor'. As well as that electric trolley you always forget to charge. Golf doesn't need to start panicking yet. Just under 3.36 million Britons played at least one round of golf on a full-size course last year, according to Sports Marketing Surveys. This is more than 600,000 down from 2003, but it is still a number that most sports in Britain can only dream of. However, golf's administrators might just have to accept that their sport will never be as popular as it was in a gentler age. And that folk who once dozed in chairs by clubhouse fires now attack hills in Lycra. What is golf's future once Woods is gone?